Photography is one of the most accessible media for reproduction of reality and fixing the environment. The world is unexpected and interesting, every new meeting can bring surprises, every journey – new experiences, everyday life – life stories. We are curious to see the world you live in! Experiment and do not be afraid to make mistakes, the main thing is story, not the rules of composition (although with them the shot looks better). The best series will be presented during evening screenings, within the framework of the main festival’s program. 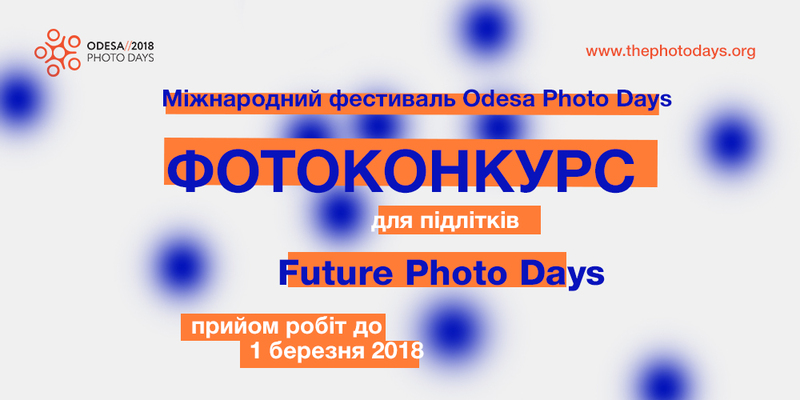 And let professional photographers and curators from different countries see young and talented artists who forms the Future Photo Days of Ukraine. It is important – parents and adults, please, support, distribute and join! In case of questions, write to us – thephotodays@gmail.com (indicate in the topic of the letter – Future). works may be submitted by the author or parents with the consent of the author. Fill in the questionnaire and send the photos to thephotodays@gmail.com with the subject “Future_Name_Man_Monitor” until March 1, 2018. * A series of works are photos that are merged into a common theme or story. It is also possible to emphasize the unity of work in form, color or technical execution. Photos can be made in any genre (reportage, studio, still life, etc. ).